Session Three of 2019 Peacebuilders Camp holds a special opportunity for youth ages 13 to 15 who want to dig deeper and think harder about what peacemaking means for them, who are eager to put their dreams into action, and who are excited about working with a team to create real change in their communities. What ideas do you have for making your world a better place? What if you could team up with 19 other young people to share ideas and turn ideas into a peacemaking plan? And what if you and your team members could then turn that plan into action? What could you accomplish? Could you . . . Teach people in your communities about fair trade? Raise awareness in your neighborhoods about nearby food deserts? Start groups in your schools to address the needs of marginalized students? Help elect local officials who are dedicated expanding human rights? Clean up streets and waterways for a healthier environment for all? Encourage others to perform acts of kindness? Meet human needs by providing food, clothing, or friendship to those who lack these resources? Create opportunities for neighbors of different backgrounds to meet each other and share their stories? Build peace in some other new and creative way? The possibilities are limited only by your imagination and passion, and your determination to make change happen! Campers who are accepted into our third week of camp, July 15 – 20, 2019, will form Peacebuilders Camp’s second PeaceJam Team. 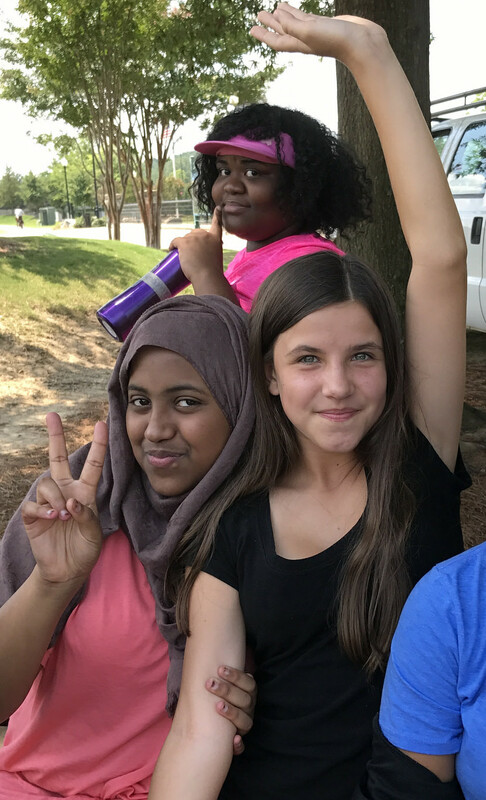 With help from Peacebuilders staff mentors, this team will design, carry out, and evaluate one or more peacemaking projects in the months after camp. In April, 2020, the team will travel to Tallahassee, Florida to present their project at a regional youth peacemaking conference called PeaceJam. August 1, 2019 – March 15, 2020 — Team members carry out their project from their home communities. Team meets virtually via Skype every two weeks with a Peacebuilders staff mentor to report their progress, and to discuss problems, questions, and issues related to their project and peacemaking. March 15 – April 1, 2020 — Team members plan their presentation at PeaceJam and divide up roles and tasks. April 2020 — Session 3 campers attend PeaceJam conference in Tallahassee, Florida and present their completed project to young peacemakers from across the Southeast, and to a Nobel Peace Prize laureate. Availability to attend PeaceJam in Tallahassee (probably April 10 -12 , 2020). Transportation will be provided from Atlanta and possibly from other points in the Southeast. Lodging and meals will also be provided. The PeaceJam Foundation is an international organization whose mission is to “create young leaders committed to positive change in themselves, their communities, and the world through the inspiration of Nobel Peace Laureates who pass on the spirit, skills, and wisdom they embody.” The Southeastern U.S. regional headquarters is in Tallahassee, Florida, on the campus of Florida State University. The conference that PeaceJam hosts every spring brings together teams of youth from all over the Southeast to present the projects that they have implemented, to participate in discussion groups and service projects, and to learn from each other and from Nobel Peace Prize laureates. Peacebuilders staff will accompany Session Three campers to the April conference. Overnight accommodations will be provided at a local hotel.